Halloween is just a few weeks away, and this means everyone is going to be consuming an unusual amount of delicious candy! This fun holiday is usually for the children, but adults seem to enjoy it just the same. According to the American Dental Association, eating candy on Halloween is ok, but it’s essential you have a plan. 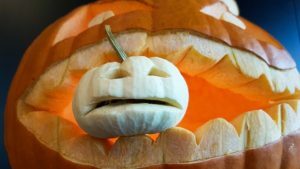 The following dental tips will help you get through Halloween without damaging your teeth. Holidays that involve sweet treats usually causes many people to forget about their diet altogether. A few candies or sweet treats on the actual holiday is fine, buy continuing to eat them for weeks afterward can destroy your teeth and your body. Maintain your healthy diet before during and after the holiday while just adding a few sweet treats on occasion. Your goal is to eat sugar-free Halloween candy, but that might not be possible during Halloween since the sweets are often given to you. An excellent rule to follow is to avoid hard candy completely. This candy might be great because you get to enjoy it longer but the truth is, the longer it stays in your mouth, the more chance it has to cause tooth decay. Gummy bears, taffy and other sticky types of candy need to be eaten in moderation. These sticky candies get stuck in between your teeth and sit there for long periods of time causing decay. You can consume these candies but only eat them if you will have access to a toothbrush and toothpaste immediately afterward. Brushing after consuming all types of candy will help prevent tooth decay. You are already going to be eating candy and other sweet treats; you don’t want to add more sugar by drinking soda, fruit juices and other types of beverages. Instead, drink plenty of water, preferably bottled water that has added fluoride. Avoiding sweets during Halloween might not be possible, so the next best thing you can do is time it right. Consume sweets after a regular meal since saliva production increases while you are eating. This will help rinse away food particles and cancel bacteria producing acids from damaging your teeth. The American Dental Association has placed their seal of approval on some extraordinary sugarless gum brands. Choose your favorite flavor and chew for 20 minutes after you eat a meal to neutralize the acid and prevent tooth decay. Sugarless gum and candy is an excellent alternative to sugar-based sweets. Remember to be cautious when chewing candy since it can break, crack or damage teeth. Consume a minimum amount of sweets, time it carefully and choose sugarless candy instead of sugar based sweets. Brush after eating meals and desserts to remove residue from your teeth. Enjoy your Halloween and eat candy responsibly! << Should You get Your Teeth Straightened at a NY Strip Mall?